Robert was a student in my first second-grade class. His mother brought him to meet me one day as I was excitedly preparing my new classroom. She sheepishly introduced him: “This is Robert. He can’t read.” I assured Robert’s mother that my approach to teaching would get Robert reading. He probably lacked confidence and needed a caring teacher who could change his attitude toward reading. I was trained by some of the most prominent people in the field of literacy, so I was more than prepared to deal with Robert’s difficulties. In my class, reading would be fun. As the year progressed, Robert’s attitude toward reading did not change. In fact, it got worse. It got so bad by the spring of that year that Robert went from an introverted, sullen boy to a full-fledged behavior problem. One day, after I had repeatedly asked him to take out a book and begin reading, he took off his shoes, tied them together, and threw them at me, yelling, “I can’t read!” It literally took Robert to hit me over the head with his shoes for me to realize that he did not need me to change his attitude or boost his confidence; he needed me to teach him how to read. I am embarrassed, in retrospect, by my willful naïveté. I persisted in my belief that I was doing the best for my students long past the point when I should have realized that in neglecting their instructional needs, I was actually doing them harm. Robert would go to third grade having neither acquired nor mastered a single reading skill or strategy in my classroom. This was especially painful because I knew that the outlook for third grade—where the emphasis abruptly shifted from learning to read to reading to learn—was dismal for those who weren’t competent readers. I felt that I had worked so hard. I had exhausted myself, staying in my classroom for hours after school devising creative learning activities and designing a rich literacy environment. I tirelessly performed everything that my teacher preparation had taught me was not only effective but also right, and yet I had failed—miserably. A great deal of content I must teach is based on the assumption that my students have certain skills, which they do not possess. When students are given strategies for accomplishing a task, they perform with greater success. One of the greatest issues of concern to me is that many of my colleagues do not want to spend time teaching something they feel students should have learned prior to entering their class. What difference does it make who teaches the student as long as the student is taught? If they do not learn skills and strategies they need, they cannot possibly move forward and access the content of any curriculum. Often my colleagues assume that a student can do the work, but chooses not to. This is difficult to assess. How do I know when a student is choosing not to work? If they are making that choice, why are they making it? Are they frustrated? I think most often the student is not taught strategies for how to react when they do not understand something. Also, they may not be taught how to generalize a strategy—that a strategy that was helpful in sixth grade may also be helpful in seventh. An effective attention-gaining strategy is the first step to an effective lesson. … Once you have begun a teaching without fully gaining student attention, you have implicitly conveyed, “I don’t really care if you listen to this lesson or not. What I have to say isn’t that important.” Once this message is conveyed, subsequent efforts to gain student attention can be difficult. Teach and use a signal such as holding up two fingers or placing a finger over the lips to signal quiet. For signals to be successful, it is essential to use your e.i. skills to explicitly teach the signal, role play the signal repeatedly, and practice it in multiple contexts. In order for attention-gaining strategies to be effective, they must be explicitly taught using multiple examples … , role-played, practiced in multiple contexts, and consistently reinforced. For example, at the beginning of the school year, the teacher decides which attention-gaining signals she wants to use (e.g., hand claps and response or call-and-response). During the first few days of school, the teacher explains and explicitly models the signal for students. The teacher and students role-play responding to the signal. The teacher randomly uses the signal in multiple contexts and then positively reinforces students for responding to it. Ideally, once students have learned the signal or focusing statement and you have positively reinforced it over time, they will respond with minimal effort on your part. For example, a few weeks into the school year, students become familiar with the routine. 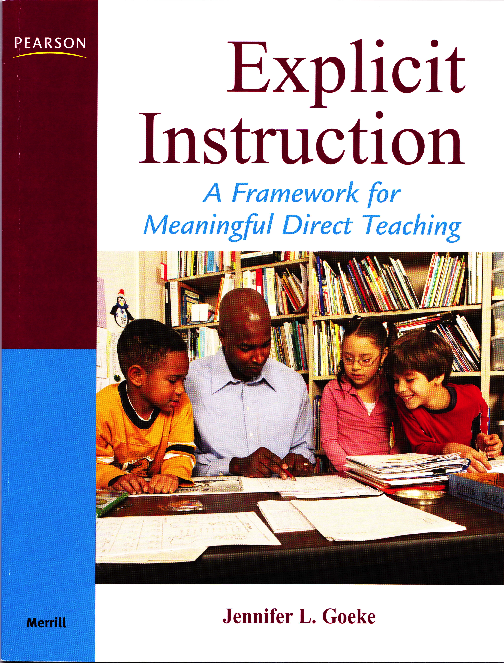 They know that explicit instruction takes place on the carpet at a particular time each day. You have given a signal for students to sit quietly on the carpet. When you come to the carpet and sit in the teacher’s chair, students automatically give you their attention. They have internalized the focusing signal and become independent; they give you their full attention without your having to do more.